He Xian Gu on a celestial crane, from the album of 18 Taoist paintings by Zhang Lu (1464-1538), displayed in the Shanghai Museum. There are eight ‘immortals’ in the pantheon of Taoism, the Chinese religious philosophy that first appeared during the Jin Dynasty (1115-1234), the last before the catastrophe of the Mongol invasion. According to Taoist mythology, the immortals inhabited a group of five islands in the north-eastern reaches of the Yellow Sea, near to Beijing, and now one of the busiest seaways in the world. He Xian Gu is usually considered the only female immortal. Originally named He Qiong, she was born during the time of the Tang Dynasty (618-907), one of the high points of Chinese culture. Her father, He Tai, was from Guangzhou, a port on the Pearl River. He Xian Gu was distinguished by six long hairs on the crown of her head. Around the age of 15, she was visited by a divine spirit who instructed her to eat powdered mica, a silicate mineral, which would cause her to take on an ethereal appearance, freed from the clutches of death. Having done so, she ascended into heaven to become a Xian, an immortal, enlightened practitioner of Taoism. 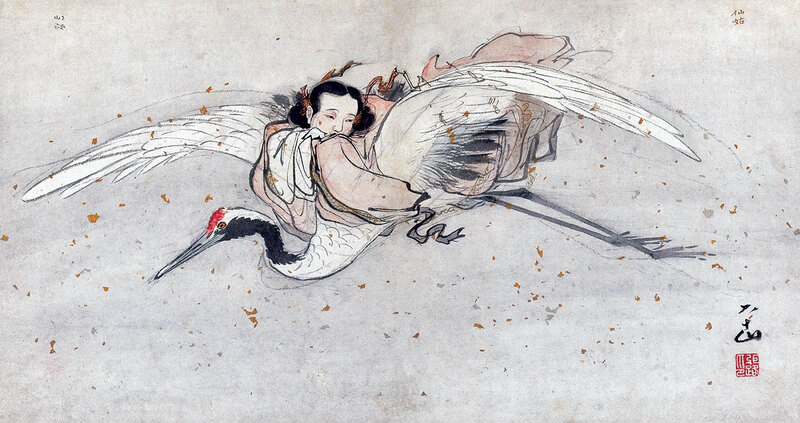 This painting, the work of the 16th-century artist Zhang Lu, portrays a suitably ethereal and delicate He Xian Gu, riding a celestial crane, her immortality established. She is also often portrayed holding a lotus flower, a source of mental and physical health, and a musical instrument known as a sheng, a reed instrument consisting of various vertical pipes.